It’s been 15 years since spirit ran from the stills again at a resurrected Bruichladdich distillery on Islay – a time marked by irreverence, innovation and acquisition. Now part of French drinks group Rémy Cointreau, can Bruichladdich maintain its independence and that maverick streak? Richard Woodard reports. Bruichladdich CEO Simon Coughlin was in Paris, giving a presentation to the board of the distillery’s new owner, Rémy Cointreau, when a PDF popped up on the screen. 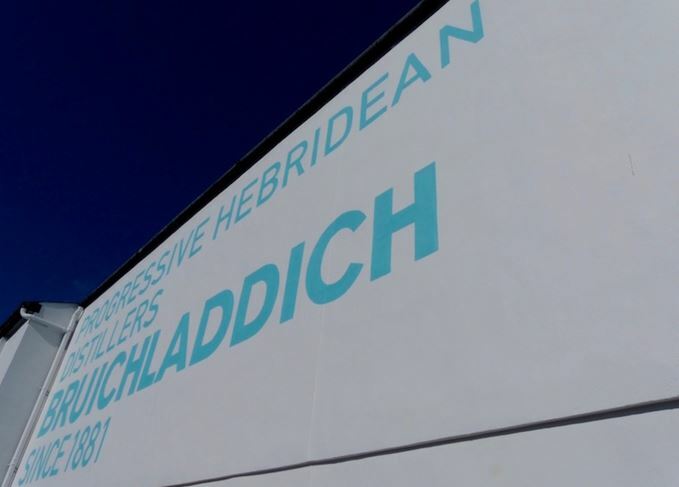 ‘Bruichladdich,’ it said, followed by ‘Progressive Hebridean Distillers’, the company’s favoured strapline. Then a glaring gap where some wording had obviously been removed. As Coughlin tells the story in his office in April 2016, almost four years after Rémy bought Bruichladdich for £58m, you can’t help wondering who would find it most reassuring: the single malt’s fanbase, many of them dismayed by the deal, or Coughlin and his colleagues on Islay. And why does he think this is the case? ‘Once they had bought [the distillery] and been through due diligence, it dawned on them that they had something different and unique. A clear commitment to the island it calls home is one of the most prominent aspects of the Bruichladdich story as it has progressed since 2001. The largest private employer on Islay, it has a workforce of 72 (and 10 more in Glasgow). If plans to malt on-site come to fruition, that roster could near three figures. Other aspects of Bruichladdich’s 21st-century character owe a lot to the past, and to the truism that necessity often proves to be the mother of invention. When Mark Reynier, Coughlin and their associates bought the distillery in 2000, most companies would have embarked on a huge modernisation programme; but they couldn’t afford to. Some investment was made – the mill was restored, and the cask management policy overhauled in line with the new focus on single malt – but now retired master distiller Jim McEwan was mostly stuck with what he’d got: old equipment and little by way of modern technology. ‘The place was in a tremendous state in December 2000,’ recalls Coughlin. ‘It hadn’t been painted for maybe 10 years. Jim would say there was never any investment went in. The irony is that’s really put us in a great place. ‘A lot of places have been re-engineered, modernised, computerised. But here there’s no pressure, no urgency to change it at all. It still works and produces great spirit.’ Necessity evolved into philosophy. Nonetheless, the hand-to-mouth nature of the early years did the old kit no favours. Bruichladdich has a notional production capacity of 2-2.2m litres pure alcohol a year; when it reopened, it was making about 250,000 litres. A gradual expansion followed, but only to about one-third capacity. Ah yes, the barley. The wine background of Coughlin and Reynier has had a clear influence on the new Bruichladdich, both in terms of wood management (a huge array of ex-wine casks in the warehouses) and in a near-obsessive fascination with whisky’s raw material. But the latter also owes much to Jim McEwan’s thoughts on the modernisation of the industry, points out Logan. ‘Barley and yeast were just commodities to be used as efficiently as possible,’ he explains. In 2003/4, Bruichladdich began buying barley from organic farmers on the Scottish mainland; in 2004, it sourced Islay-grown barley for the first time. Now the company has a direct relationship with 19 farmers, 14 of them on Islay, with that number set to increase. This is an exercise in traceability and provenance, but also in flavour exploration. Different strains – including the ancient Bere variety – and different origins; the wine concept of terroir, you might say, brought to bear on Scotch whisky. In 2013, regional trials began, using barley from three farms in three regions – Lothian, Aberdeen and Black Isle – kept separate from field to cask. Fifty tonnes from each farm in 2013; 100 tonnes in 2014; 200 tonnes last year. With the Scottish mainland regional trials only beginning in 2013, it’s clearly still early days; this is a project with years, if not decades, left to run. It’s also work that feeds into the currently hot topic of transparency, following Compass Box’s run-in with the authorities and subsequent campaign launch. Even before the furore began, Bruichladdich had plans to reveal the detailed recipe for bottlings of its Classic Laddie NAS expression (cask type, year of distillation, number of casks in vatting, barley origin), but it took a few years to come to fruition. If the use of locally grown barley was an obvious extension to Bruichladdich’s Islay-centric philosophy, there’s still lots of potential to take that local connection further in other ways. Malting, for one – Bairds currently malts everything in Inverness, meaning quite a round trip for barley grown a stone’s throw from the distillery. Yeast is another potential area of exploration – to date, Bruichladdich has done little work here – as is, more glaringly, peat. The peated malt used for Bruichladdich’s smoky siblings, Port Charlotte and Octomore, is also produced at Bairds, using peat from the Black Isle. ‘We’d like to change that between now and having our own maltings,’ admits Coughlin. ‘It would be nice to work with Islay peat, but there are lots of factors involved in that, including how it’s cut.’ Indeed, an experimental load from Octofad Farm was rejected as unsuitable by Bairds. ‘We’re trying to use another peat source on Islay which isn’t Octofad, but is on the Rinns,’ says Coughlin. The decision to go with Bairds in the first place came out of the company’s willingness to work with small batches in the early days at Bruichladdich. Coughlin contrasts this with Islay’s own maltings at Port Ellen, which he said had demanded bigger batches, six months’ notice before malting and money up front. That peat will continue to be part of the Bruichladdich story is clear. Logan is convinced that it would have been used until 1962, when Bruichladdich closed its maltings, and spin-off peated variant Port Charlotte – which Coughlin would like to expand – is an attempt to replicate that. The fiercely peaty Octomore, however, is another matter. ‘It was really a “what if” conversation,’ says Logan – one which began in a geeky discussion with Bairds about how they arrived at Port Charlotte’s desired peating level of 40 parts per million (ppm). Bairds’ technique – in contrast to Port Ellen – was to malt a batch of barley at 60-70ppm, then blend that with non-peated to come back down to 40ppm. ‘Jim was asking about the 60-70ppm stuff,’ recalls Logan. ‘Could we distil that? Bairds wondered why we would want it, but we said we’d just like to try it.’ The first batch came over at 80ppm – and Octomore was in business. The overall product roster at Bruichladdich looks relatively settled today – production is still roughly split 70% Bruichladdich, 15% Port Charlotte and 15% Octomore – but the distillery’s range of expressions over the past 15 years has been frankly bewildering. This creative chaos had a few consequences, says Coughlin: ‘The core range went pear-shaped; we did crazy stuff; the retailers told us to stop releasing stuff. But it was exciting – we learned a lot about branding, cask maturation and so on. Then we thought: we need to get a grip. ‘It started to confuse the trade and customers and – quite frankly – us. The drams were great, but we started to wonder just what is Bruichladdich.’ A more disciplined and market-attuned strategy has ensued. The story of Bruichladdich’s approach to new product development – shaped partly by pragmatism and the art of the possible, and partly by a ‘try anything’ creative philosophy – arguably stands for the business as a whole. Things have certainly changed since the days when the now departed Mark Reynier ruffled feathers throughout the industry with his periodic outpourings. ‘Mark was quite gobby, but it did us no harm,’ says Coughlin now. ‘It got us a lot of coverage in the early days. There was a lot of provocative stuff going on. That innovation hasn’t left, but it calmed down for a bit while we got used to Rémy. Detailed information on the make-up of Port Charlotte Scottish Barley is now available online. The party lasts all day at Bruichladdich – but serious tasting underpins the carnival atmosphere.